To find out what alumni love most, the Office of Alumni Relations sent queries out to graduates via Facebook, LinkedIn, and Twitter, hoping to come up with at least 100 favorite things. Were we surprised by the result! At last count, more than 200 members of the University community responded. Submissions included at least 20 favorite professors. Here we present just a few of the places, people and things that came up repeatedly. The larger list — including those professors — can be found at blogs.shu.edu/alumni. “Hazard zet Go Around.” Of course, that’s not what it says on the University seal engraved in granite at the center of the University Green. Yet, “avoiding the seal” while traversing the Green is just a matter of course and a big memory for many alumni. 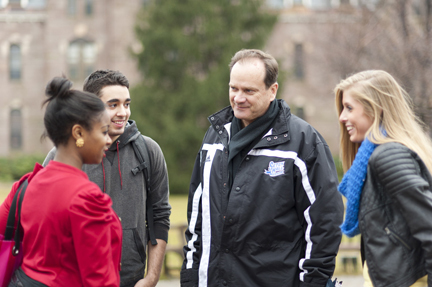 Alumni recall being told about the custom during their first tour of the campus. The student guide would “casually joke” that those who trespass “will not graduate,” says Patrick McCabe ’11, of Westfield, N.J.
Planning to study for a master’s degree, “I still don’t walk on it,” says McCabe, now an admissions counselor in Bayley Hall. The tradition dates to before 1986, when graduations were still held on campus and some were staged on the Green. The seal, in effect, marks the spot. Not wishing to compromise their chances of seeing that day for themselves, students steer clear. 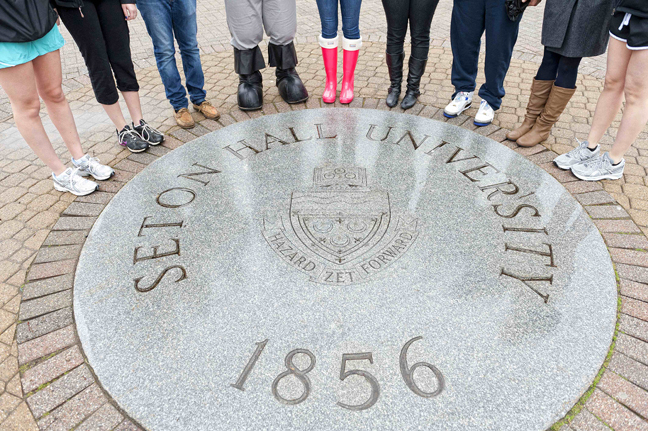 “I would never, and I die a little inside every time I see someone walk on it,” says Gina Ianniello, a freshman from Staten Island, N.Y.
One prescription for “reversing the curse” for walking on the seal is to touch the foot of the Pirate statue keeping watch outside the Recreation Center. Some also rub the Pirate’s foot for luck. The practice began shortly after the statue — a gift from alumni — was dedicated, recalls Kara Lennon ’98, who was a member of the swim team. At his post outside Duffy Hall, Father John Daniel Dennehy ’79/M.Div. ’84 is the closest thing to a live version of the bronze Pirate. Ordained a priest in the Archdiocese of Newark in 1981, he has been University chaplain since 2003. Most class days, he stands along the busy path during class changes at 9:45 and 11:15 a.m. and 12:45 and 2:15 p.m. His sensitive eyes often shielded by his Oakley sunglasses, he tosses “Good mornings” or “Good afternoons” to everyone making the trek and, if someone wants to stop and chat, he makes time then and there. So often the Chapel of the Immaculate Conception is cited as the heart of Seton Hall. Let us count the ways: a sanctuary for quiet reflection and communal worship — and a place where a lot of students and graduates come to get married. Janine Colasanto ’97 and Marc Colasanto ’96, met at a fraternity party and returned to the campus in 2001 to pronounce their vows — as many do — before Father Paul Holmes ’77, S.T.D., distinguished University professor of servant leadership and chaplain to Phi Kappa Theta, Marc’s fraternity. “We always knew we were going to get married in the chapel,” Janine says. “There’s no church we could have picked that would have been more meaningful.” The couple now lives in Brick, N.J., with their two daughters. The chapel has been the setting for almost 150 weddings during the last five years. Alumni also bring back their kids to be baptized — 202 since 2007. Among them were Emily and Stephanie, the daughters of Jennine and Joseph Arena (both ’93), of Doylestown, Pa. The sacramental tradition began in her sophomore year, when Jennine celebrated her Confirmation and First Holy Communion in the chapel. That was just three weeks after she met Joe. The couple married in the chapel in 1997. “I always thought of it as my church,” she says. Fred Szibdat ’84, of West Orange, started attending Sunday Mass there about seven years ago. After meeting his future wife, Gerry, she joined him in his regular pew. When it came time for their wedding on April 30, 2011, no other place had the spiritual significance — or charm. “It’s hard not to fall in love with the chapel. There is such a specialness to it,” Fred says. Alumni also recalled the excitement of 1989, the year the Pirates came tantalizingly close to clinching an NCAA championship during P.J. Carlesimo’s tenure as asketball coach. A Galleon Room stalwart since 1990, Virginia McKenna’s menu of friends is far more extensive than the variety of tasty sandwiches and other treats she serves with a smile and warm greeting day after day. A coal miner’s daughter from West Virginia, McKenna now lives in Newark and rarely misses her 6 a.m. to 2:30 p.m. shift. 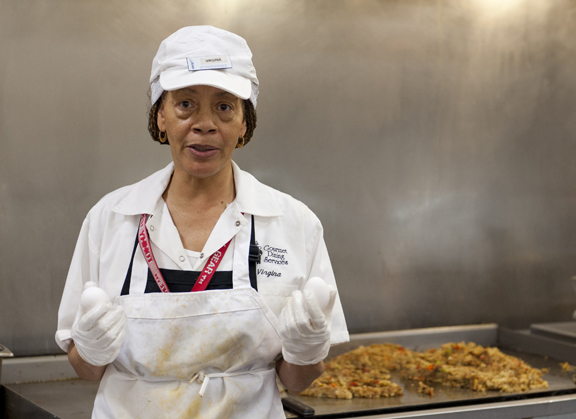 Her first job was at the dessert counter, but within two years she got the hot spot at the grill. Referring to the cakes and pies she once doled out, “the boss said I was eating more than I was selling — and you can quote me on that,” she laughed. 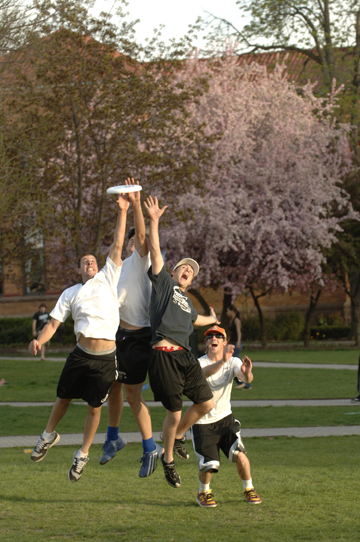 Games of catch or throwing Frisbees. Snoozing or reading beneath a warm sun while sprawled on a blanket, or sitting on a bench. It doesn’t take much fair weather before a crowd begins to converge on the Green. “It was always a place to go to have fun, relax and be with friends,” recalled Danielle Picklo ’08 of Lanoka Harbor, N.J. The Christmastime lighting of the tall evergreen near Presidents Hall is another fond memory. Sororities? 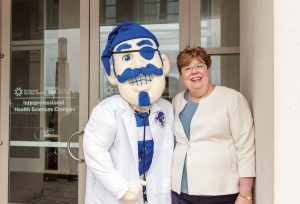 No way, Ashlie Verano thought as she readied herself for her first semester at Seton Hall. But she was living far from home and family in Los Angeles, and the transition to college was tough. Not too long into her first semester, she was filling out paperwork to transfer, until suite mate Emily McVey suggested she accompany her to a Delta Phi Epsilon event. The transfer papers were never completed. 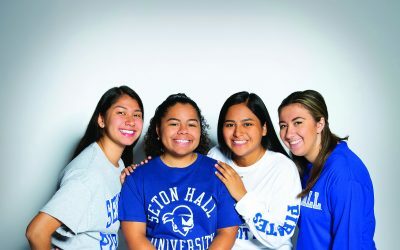 Joining the sorority “completely changed my outlook at Seton Hall,” sophomore Verano says. Yes, the social opportunities are many, but fraternities and sororities also spearhead a host of philanthropic causes and build a network of contacts that endure long after graduation, says sophomore McVey, of North Arlington, N.J. 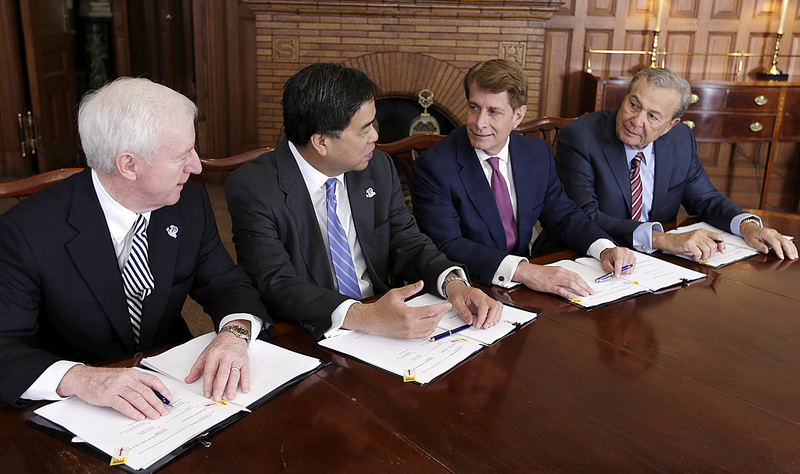 The ties begin forming during the new-member-education period. “You all have that same bond doing the same thing and it forms a basis for brotherhood and friendship,” said sophomore Giovanni Interra, of Pleasantville, N.J. 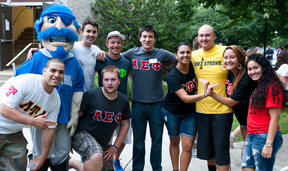 Joining Phi Kappa Theta this year, Interra said, has made him feel even more at home at Seton Hall, especially when alumni return to network with brothers. Theatre-in-the-Round directors like Gilbert L. Rathbun, founding professor of the communications department, James P. “Doc” McGlone ’54 and longtime set designer Owen McAvoy all stirred memories in alumni. So do the very walls. An informal practice had cast and crew members etching their names on the cinder- blocks of the wall behind the “12 o’clock chute” and in the men’s dressing room. But the plays were always the thing. “Working as house manager and assisting in many productions, many of the friendships built in the 1960s still last today,” says Harry Shapiro ’70, of Glendale, Arizona. Before or after passing Father John comes the “wind tunnel,” the overpass created in 1986 when Xavier Hall was built above the sidewalk that connects to the east and west sides of campus. Abandon light and warmth all ye who enter here — and hold on to your hats and umbrellas! Alumni remember another frozen zone between Marshall and Mooney halls, where a draft was intensified by a passage, since demolished, that linked the second floors of the buildings. 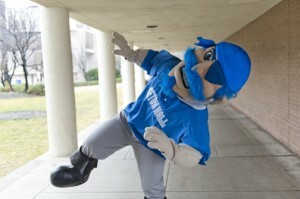 What do you love most about Seton Hall? 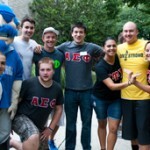 Go to blogs.shu.edu/alumni and let us know. Catering to student metabolisms that cry for sustenance while other mortals slumber, El Greco remains open so food can be had well into the wee hours. Best of all, it delivers. “El Greco’s pizza is the best there is and it’s open late,” says freshman Marina McDermott, of White Bear Lake, Minn., who orders from there at least once, if not twice, a week.